A windfarm in Cornwall is continuing to operate despite a half-tonne blade shearing off one of its turbines. The incident happened on Friday at Cold Northcott, near Launceston. No-one was injured. The farm has 22 turbines and is owned by the power company EDF. 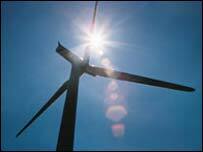 Cumbria Windfarms Ltd, which operates the site, said the turbine affected was a different model from the other 21. The Health and Safety Executive will decide if an official investigation into the incident is necessary. The windfarm has been operational since April 1993 and has turbines which are up to 36m (118ft) tall. Cumbria Windfarms general manager Trevor Gait said the incident was a "freakish one-off". He said: "This particular turbine is a one-off on the site. It is particularly different to others in blade design and control for us not to be compelled to turn off the others at this stage. "We've had various mechanical incidents, but nothing like this that would cause the blade to break." Mr Gait said the turbine was being dismantled to carry out an investigation, and added that the renewable energy organisation British Wind Energy Association had been informed of the incident. He added that it was unlikely that high winds during the day were responsible for the blade breaking. He said: "At present, we don't know what the cause is, but we're taking the turbine to the ground and will carry out an investigation."